When asked what my favourite cuisine is I will answer Vietnamese straight up. Saying that, this is always a question that makes me think. 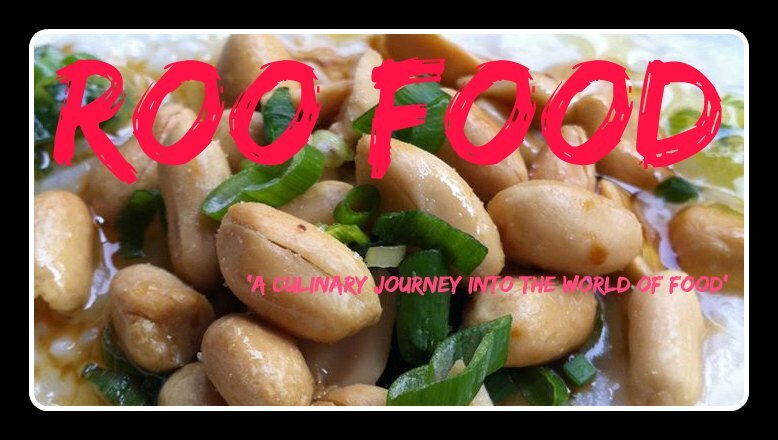 Being the world traveller and global eater that I am there are many cuisines that fall into this category of 'favourites'. So the question should be more on the level of what Asian cuisine is your favourite. I have been a long time follower and fan of Luke Nguyen. I have a number of recipe books and watch his TV shows. I also have a copy of the 'Secrets of the Red Lantern' and have thoroughly enjoyed reading this too. I'm always inspired to re-create dishes from these books. Red Lantern has been on my radar for sometime and with friends visiting from Dubai (via Quebec) this was the first place that was a must to celebrate my friends birthday. Arriving at the Red Lantern on Riley, I first notice the friendly welcome, the warmth of the space and the definite feeling of being transplanted into any restaurant in Saigon or Hanoi. I'm left with a yearning to return to Vietnam instantly. We are shown through to Red Lily at the back of the restaurant, which is the cocktail bar. The menu is vast and vibrant and rich with tropical fruit infusions. I had the Pham Fatale and it was so refreshingly tasty. The intense kaffir lime hit makes my taste buds tingle with pleasure. Love this cocktail. Well take a sip of each others (for reviewing purposes) and they are all delicious. 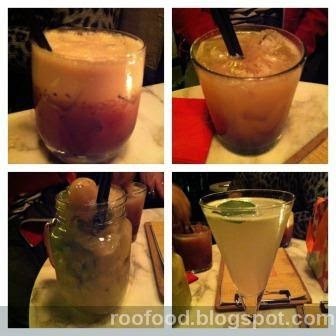 I could drink these cocktails all night. We were finally seated and ready to devour the menu. 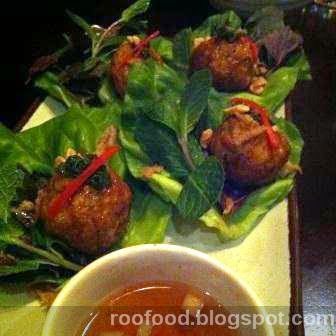 There is so many amazing dishes and it was hard to choose just a few to share. Choosing entrees's seemed to be easier than choosing mains. Entree's just seemed to pop out at us. 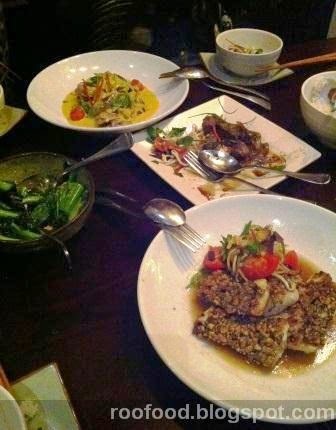 We start with 3 entree's to share. Soft rice paper rolls of char grilled honey pork and Vietnamese herbs. 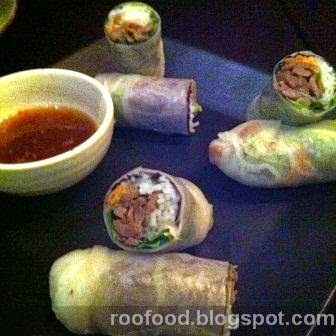 Fresh rice paper rolls are always a great way to start a meal. Fresh, herby and so very tasty when the filling is perfectly balanced. The honey pork is wonderfully sweet and charred. I was curious about the prawn and cauliflower fritters and just had to sample them. Spencer gulf prawns and cauliflower fritters served with sweet fish sauce. Enveloped in lettuce, herbs and peanuts, dipped into the sweet fish sauce...popping these into your mouth was a pure pleasure. But it was the last entree that stole the dish of the night for all of us. 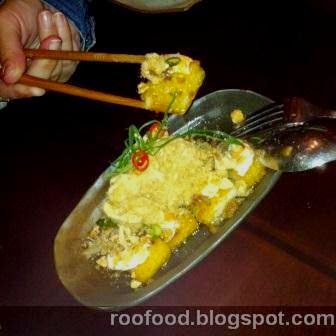 This is Aunty 5's rice cakes with tiger prawns, caramelised pork, pork floss and shallot oil. I think there was a moment of silence with a moan or two from the four of us as we relished every single bite of this dish. This will be ordered again for sure! I know I have the recipe for this but to try and duplicate it might just burst the bubble. As mentioned earlier, mains were a little harder to choose. We wanted everything but knew the tummy capacity was not going to allow that. In the end after much discussion we went with 3 dishes and a side with steamed rice too. I ate many versions of this dish while living in Cambodia and it's a staple favourite. 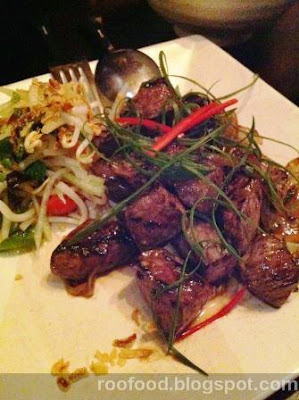 Red Lantern's version is made with O'Connor Black Angus beef strip loin tossed in oyster sauce and sesame (although traditionally it is made with garlic and black pepper). We are torn with this dish. half the table enjoy it, the other half not so much. 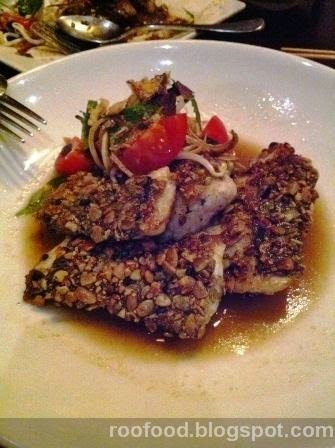 The seeded crust is crunchy and nutty however the actual fish leaves a 'muddy' taste in your mouth. That is not necessarily a bad thing. If you prefer your white fish only you may have some problems with it. I'm okay with the 'muddiness' of the flesh and it doesn't displease the pallate so much AND I WISH I COULD REMEMBER WHAT TYPE OF FISH IT WAS! It appears that I haven't a decent photo of our third dish (but it's here in the background). Burrwaong duck yellow curry with eggplant and cherry tomato. This was a lovely light curry and the duck is cooked between a medium and well done. 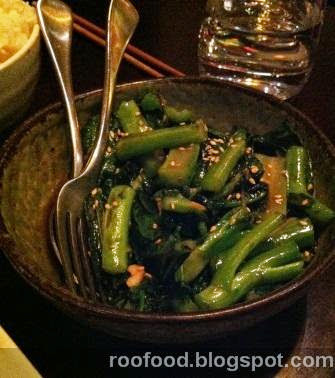 We go with a side of tossed greens and steamed rice. The tossed greens in bean curd are moreish and I keep going back for another piece. Of course no dinner is complete without dessert and we decided that we would share one. 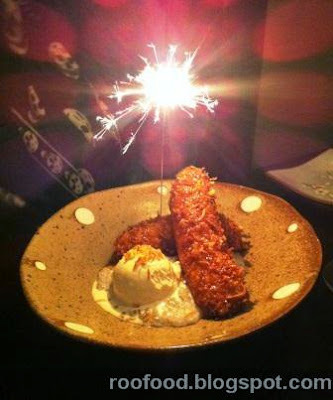 As we were celebrating Mrs Fu's ('25th') birthday she was surprised with a sparkler. We had the banana fritter.. They only way to eat bananas in Asia in my opinion! Coating in shredded coconut and served with icecream. This has been on my radar for a while now too! Aunty 5's rice cakes looks awesome! Hahaha agree with the banana fritters!